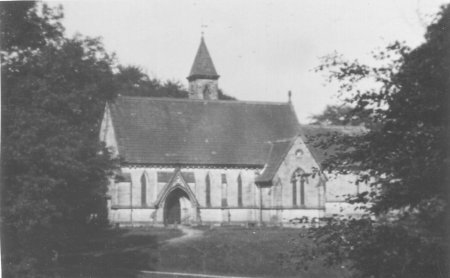 All Saints Church is a chapelry in the parish of Wirksworth. Matlock Records Office has records of marriages there 1936-1979 and burials 1861-1937. 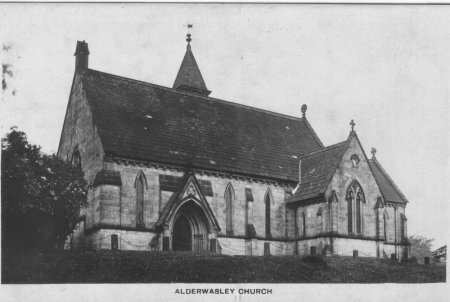 Alderwasley Hall, the former home of the HURT family, which in recent years has been put to various educational uses, is situated in an attractive park. 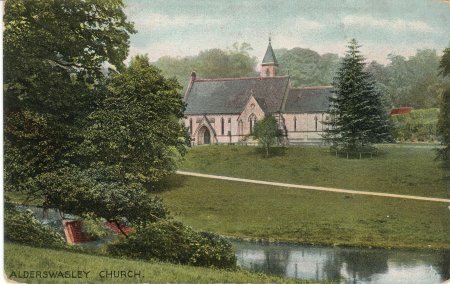 Within the gates of the park is Alderwasley Church; few churches in England can be in such a delightful setting. A cedar tree stands guard, while just below, a sparkling stream runs with little waterfalls and ornamental lakes. The HURTS were involved in lead smelting and one souvenir of charcoal burning still remains in the form of a fire damaged yew tree known as "Betty Kenny's Tree". Betty, or Kate to give her correct name, came with her husband and young family every year to burn charcoal. They lived in an improvised hut and in good weather the baby slept outside in a hollow, horizontal branch of a tree, which it is suggested gave rise to the nursery rhyme Rock-a-bye-baby.